The funeral industry is unique in both its scope and its service. No matter how beautiful the flowers or flattering the words describing the deceased, nothing can alter the absolute finality of personal loss. For funeral home directors, owners and managers, you often see your customers at their absolute worst, hopelessly absorbed in the agonizing loss of a loved one, and your only course of action is to compassionately soothe and ameliorate the impact of their losses by providing subtle accoutrements that serve to calm and bring peace to their broken hearts. You do this by providing an array of behind-the-scenes efforts that make an otherwise unpleasant life event as pleasant and organized as possible. In some cases, soft music accompanied by soothing, linear and diffused scents strategically situated throughout greeting areas and restrooms particularly, can serve to alleviate the pervasive stress, frustration, anxiety, tension and sadness of the moment and provide a serene spot to go in the mind’s eye where, for even a few fleeting moments, the distraction can relieve the torment of emotional pain. But how do you provide effective odor neutralization along with reliably-diffused, calming fragrances for those honoring their loved ones? Read on as our ambient scenting experts provide insight on how ambient scenting can enhance your environment, which scents are best for grieving environments, how to effectively combat malodors and descriptions of an array of large and small area scent machine options that can help provide evenly, linear scent diffusion for any space, large or small. We’ve written extensively about the power of scent and how it can improve workplace productivity in office environments, reinforce brand recognition for hotels, heighten energy for workout rooms and fitness centers, or establish a sense of calm and rejuvenation for medical and holistic facilities. But how do you approach the delicate matter of helping to alleviate the natural responses that come from the process of grieving as it pertains to scent? Innately, funeral scents should be light, comforting and fresh, and some funeral homes use air fresheners, candles and other perfumes. Unless a family has designated the creation of a special scent to symbolize their loved one’s life force and passion, a funeral home should diffuse a fragrance that is nurturing, uplifting and so unique that mourners are not likely to associate it with any other. Ambient scenting is an art form and can be a tremendous mood enhancer, and the selected pleasant and almost subliminal aroma must be diffused subtly and almost imperceptibly in order to achieve its full affect on a room full of mourners. Back in the day, the most common scent associated with funerals and other spiritual ceremonies down through the centuries has been incense. By the 5th century AD, scented oils as well as incense became integrated with religious rituals all across Europe including those of both Judaism and Christianity. The secret language of floral scents expressed those feelings that were too painful to vocalize, and they also served as a means to mask the unpleasant odors of decomposition. The aromatic essence of fragrant blooms is integral to almost every type of funeral service. Today, blends of classic floral scents are often employed to create a favored funeral home fragrance, and essential floral oils can render emotional stress a little easier to tolerate. In terms of aromatherapy, some essential oils that can be used to help ease grief and sadness include: citrusy, bitter and tart Bergamot, soothing Roman Chamomile; intensely sweet Jasmine; deep piney and citrusy Sweet Marjoram; sweet and somewhat metallic Neroli; honey, spicy and fruity Rose; pungent, warm and slightly sugary Nutmeg; lemony and woody Frankincense, lemony Melissa; earthy and woody Vetiver and creamy, sweet Vanilla. In the past some funeral homes might use conventional air fresheners and candles, they alone were not effective enough to neutralize the odors inherent in such spaces or evenly distribute scent throughout smaller and larger interior environments. With 70 years of laboratory and on-site experience, we know full-well that a scent is only as good as the air freshening system diffusing it, and our decades of refinements have resulted in an arsenal of high-tech, state–of-the-art applications to suit the odor control and scenting needs of any-sized funeral home. Our three best selling ambient scenting diffusers are: The Aroma Beam, The Aroma Styler and The Aroma One. The Aroma Beam method of dry vapor scent diffusion is specifically designed to freshen interior areas up to 50,000 cubic feet. This non-nebulizing system (without wet vapor) is conveniently controlled via a smart-phone app for Android and iOS. It is perfect for ambient air-care in reception and viewing rooms in large funeral homes. Air-Scent’s development of a proven customized scent is precisely designed to accommodate a specific space and interior design. When using the Aroma Beam, there are no messy liquids to contend with or complex timers to set. Our two, 30-day, specially formatted refill cartridge systems (the Scentsia collection and Squair™ Solids) can plug into any standard wall outlet. 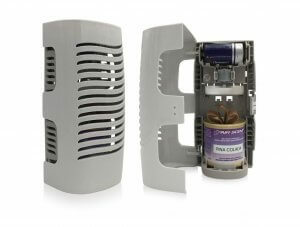 There are many options of near subliminal scents to choose from and three different mounting options. This HVAC atomizing diffuser system comes in three application sizes and is controllable and easy for funeral directors to use. 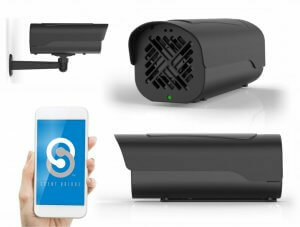 Cutting edge and innovative technology creates a fine particle dry vapor mist that is invisible and floats evenly across any large open space reachable by the HVAC air flow. This system is ideal for ambient scenting. It control funeral malodors and greatly improves indoor air quality for both large and small funeral homes. The Aroma One fan air freshener is an odor-neutralizing system, which annihilates airborne odors and at the same time, offers superior, linear, aroma enrichment for any small space, particularly but not exclusively for restroom-specific malodors. Some of its most desirable features include: a, sleek, modern design with optimal air flow; its ability to hold many Air-Scent refill types, including bottles, liquid can and Solid Squair wafers; top-performing air velocity fan blade; its easy conversion from battery to electric and its clever nesting tray features such as the on board drip guard, ventilated refill holder and air flow retardant to lessen output when desired. Funerals and death are part of the cycle of life, and grief for every culture and tradition known to mankind has its own means of expression. Catholics stay for up to a week with the loved one’s body and believe that death is the passing from the physical world to the afterlife, where the deceased’s soul will live in Heaven, Hell, or Purgatory. Jews sit shiva and create a space that includes covering all the mirrors in their homes during their mourning period. Greeks observe a forty-day mourning period after the funeral, and a number of cultures follow a body or coffin to its final destination. In New Orleans, this is a celebratory affair where an orchestra playing Dixieland jazz follows the casket to the cemetery. The need to say “goodbye” is as universal as death itself. The sudden loss of a loved one temporarily shatters all reality and perception. Funeral managers have to handle matters delicately and deal with business matters when people are emotionally distraught. The grieving process takes time and there are five distinct stages, but for each person the length and degree of suffering will vary. They are: denial and isolation; anger; bargaining; depression and finally acceptance. In addition to the need to formally say goodbye in some sort of ceremony, there are also accessories required for the painful journey. These include music, urns and soothing scents, all of which should be presented with a light touch. Intangibly as well, within the funeral industry, customer service is strained to the optimum in order to address the needs of the mourners. The proper language, demeanor and body language can render the impression that the loss of a loved one isn’t a transaction, albeit technically, it really is. The trend towards personalization is becoming more and more popular in funeral services. This includes so much more than a pastor, priest or rabbi reciting things the family told him or her about the deceased. It means honoring the unique qualities the deceased possessed, mirroring his or her loss to loved ones, and in the case funeral home directors, providing a soothing, fragrance-enhanced environment. Bad odors in any environment are bad for any business or experience; a smelly, offensive odor wafting through such a sacred time as a funeration service is unacceptable, and you need to guard against that for the sake of your business, but more for the sake of those honoring their loved ones. Funereal parlor malodors are challenging and very different from others. They are most often directly related to the daily operations of the funeral home, which might include embalming fluid, which can smell like astringent. If the embalming chamber is poorly ventilated and a potent fluid is used, nearby rooms may have a very unpleasant odors including publish washrooms. Some other common odors include: cleaning products, residue from clients who are heavy smokers, have poor personal hygiene or who wear heavy perfume. Even some floral arrangements and plants sent to the funeral home for the family can have odd and even funky smells. The prep area in a funeral home is the only room that should have a strange smell. All other spaces should reflect familiarity and a home-like atmosphere. The funeral parlor is not and can never be home, but it can render soothing sounds and pleasing scents to help to simulate a comfortable and homey setting. Our ambient-air care masters understand both how to utilize the power of scent to create a caring and comforting environment for funeral parlors, but also how to eliminate odors. Our patented Metazene® molecular odor neutralizing additive is used within all of our fragrances and air freshening systems and effectively neutralizes malodors at the molecular level. There is no more powerful solution to remove unpleasant odors within any interior space. The business of death and dying in some ways is like any other when it comes to pleasing their customers with their services and offerings. It is the emotional element that is so critical here that sets the industry apart from all others. In this regard, funeral directors can compete by providing a soothing grieving experience for their clients. Little things can mean a lot when people are preoccupied with the loss of a loved one. The proper scent infused within such a setting can make all the difference in the world. If you own or operate a funeral home and are looking to enhance your environment, don’t hesitate to submit an inquiry or give our team a call today.